Why is Scottie Thompson the Finals MVP? If there’s one play that defined just how valuable Scottie Thompson is to Barangay Ginebra, it’s that play in the second quarter of Game 6 of the 2018 PBA Commissioner’s Cup Finals, where Scottie grabbed an offensive rebound. It’s not just that Scottie, 6-foot small, grabbed an offensive rebound (like he always does), it’s how he did it: impossibly outrebounding 7-footer Greg Slaughter and 6-foot-4 Arwind Santos, which was as impossible as…outrebounding 7-footer Greg Slaughter and 6-foot-4 Arwind Santos. And it’s not just how he grabbed the rebound, it’s how he, after securing the ball, had the basketball IQ to throw a no-look pass to teammate Kevin Ferrer, who had an open path to the basket. That offensive rebound—that one in the second quarter of Game 6, where he outrebounded Greg Slaughter and Arwind Santos, and then threw a no-look pass to Kevin Ferrer—is just one of Scottie’s 13 rebounds in the title-clinching Game 6; just one of the many loose balls that somehow ended up in the hands of Scottie Thompson. 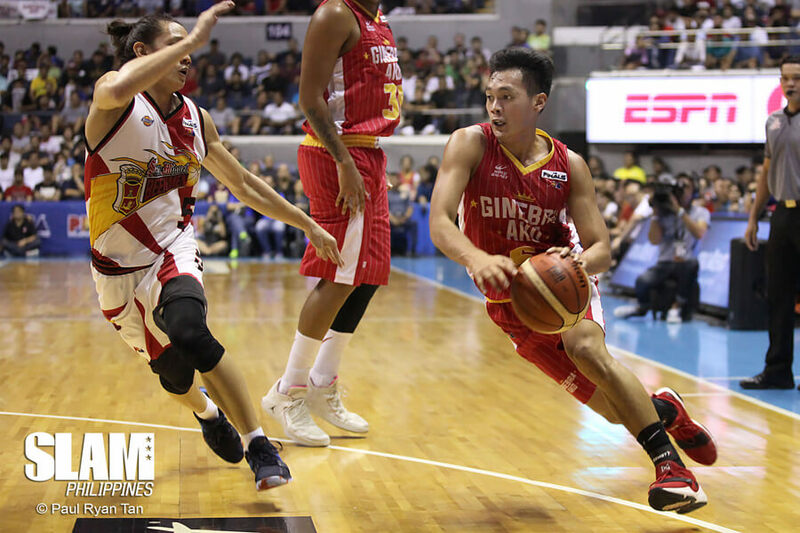 If there’s another play that defined how valuable Scottie Thompson is to Barangay Ginebra, it’s that play in the fourth quarter of Game 6 of the PBA Commissioner’s Cup Finals, where Scottie grabbed a defensive rebound. It’s not just that Scottie grabbed a defensive rebound (like he always does), it’s how he did it: kalawit-style, outrebounding Slaughter, June Mar Fajardo, and as a bonus, Christian Standhardinger. The rebound came after a tomahawk dunk from Ginebra import Justin Brownlee, which drew a loud roar from the Ginebra crowd. But that defensive rebound—that one in the fourth quarter of Game 6, where he outrebounded Fajardo, Slaughter, and Standhardinger—drew a much louder roar, a roar that’s bloodcurdling, a roar reserved for historic moments like when oppressive governments are overturned or when The Rock shows up unannounced on Raw or when KathNiel sing and hold hands in one of their mall shows. That’s how loud the crowd got because that’s how special that rebound was. It was Scottie’s 13th rebound of the title-clinching Game 6; his last rebound of the PBA Finals. Scottie’s rebounding wizardry is no secret. By now, white boards in opposing teams’ locker rooms should already have the words “BOX OUT SCOTTIE” written in red, permanent marker. But guess how Ginebra scored its first two points in Game 6? Via a Scottie Thompson put-back off an LA Tenorio miss. But, if there’s one game that defined how valuable Scottie Thompson is to Barangay Ginebra, it’s Game 5, where not only did he grab 11 rebounds, he also scored 20 points, including six of the biggest, game-changing, series-swinging points that Scottie has ever scored in his PBA career. The first two of those six big, game-changing, series-swinging points came from the free throw line, after Scottie again managed to lurk inside the paint undetected. Fajardo was late in spotting him, and had no choice but to throw his 270-pound frame into the much smaller Scottie. The blow sent Scottie crashing down on his right hip. For a few minutes, he laid with his back on the floor, his eyes closed, his hand massaging his hip. He then proceeded to hit two free throws like nothing happened. Ginebra down a point. The second pair of points came from a floater over Fajardo, who was again late in spotting Scottie, who again managed to lurk inside the paint undetected. Instead of challenging Fajardo, Scottie—his hip probably still throbbing from the play before—settled for a high-looping shot. Ginebra up a point. The third pair of points came from a fastbreak lay-up, as Scottie again managed to find himself open inside the paint. Ginebra up three points. In that personal 6-0 scoring run, Scottie Thompson showcased his gift: the uncanny ability of being at the right place at the right time. In case it’s unclear just how valuable Scottie is to his team, there he was in that one and a half minute stretch, waving the reasons furiously to the faces of the San Miguel Beermen, to the thousands in attendance at the MOA Arena, to the millions watching, and to those who are still foolishly doubting him. By Game 6, sometime in the third quarter, everyone had already accepted it as fact. Brownlee is Ginebra’s best scorer and Ginebra needs Slaughter to be 100% and Ginebra will live and die with Tenorio. But Scottie Thompson is Ginebra’s most valuable player. Scottie’s gift is not just his uncanny ability of being at the right place at the right time, it’s also his uncanny ability of knowing exactly what to do when he gets there. When he accepted his Finals MVP award, he passed credit to his teammates (like he always does). Not once did he talk about himself, even questioning if he really deserved the honor. Because if there’s one thing that defined how valuable Scottie is to Barangay Ginebra, it’s how he snuck behind everyone undetected, jumped a millisecond ahead to take the Finals MVP trophy away from the comebacking Slaughter, away from the always perfect Tenorio, away from super import Brownlee, away from the 6-foot-4 Santos, away from the 6-foot-10 Fajardo. Like the loose balls that somehow found their way into his hands, the Finals MVP belonged to Scottie.